For the 2nd year, Anderson brings on a Techzilla bat into the USA space. After a few hours hitting with a couple different hitters here is our 2019 Anderson Techzilla Review. The feel is good. We don’t know that it is as good as some two piece composites out there. But, Anderson’s two piece connection does a decent job of dampening sting. Our hitters liked the end load feel and real power when you found the sweet spot. The bat was advertised as an e… Jump to the full review. We aren’t the only ones to have information about the Techzilla. Other places, in particular those who sell bats, usually have a boiler plate write up on the specs of a bat. Many of those we reference to make sure we are seeing what we should be. Here are some more references for the 2019 Anderson Techzilla review. The bat was advertised as an end load. Although it is advertised as a heavier load, our swing weight measurements showed it right in line with other drop 8 USA bats (like the Beast Pro from Easton). We’d recommend the bat for bigger hitters looking for a straight forward hybrid bat in the USA space. Those who aren’t looking for a massive barrel but, instead, a well balanced bat with a good feel in the drop 8 USA space then this fits right in your wheelhouse. Since the bat’s weight comes in a 22, 23 and 24 ounce version the Techzilla will fit mostly in bigger hitter’s hands. Big swinging 11 and 12 year olds as well as the average size or smaller 13 year old should be right at home. Performance wise we’d put the bat up against anything in the USA hybrid space. Last year's bat was considered a drop 9. This year's is a drop 8. We did the swing weight for both bats and found them to be very similar in swing weight--although our 2019 version did come in all of 2% more. (Our actual scale weight showed the 2018 a tiny bit heavier, actually. But, swing weight is a different animal altogether). But, we chalk that up to manufacturer tolerance. What we think might have happened, and this is just a guess, is the 2018 and 2019 bats are mostly identical but the 2018 version made more sense a drop 8 bat---there is a bigger more concentrated market there. Who wants a drop 9 anyways? In any event, expect the same bat when comparing the 2018 or 2019 version of the bat. Both solid. 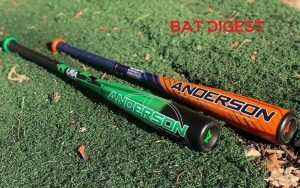 We spent several hours using the 2018 Anderson Techzilla S-Series bat before writing this review. That includes using the bat during live pitching with multiple hitters, hitting with the bat in cage and measuring many of its metrics like exit speed and swing weight. The most comparable bat in the USA drop 8 space is Louisville Slugger’s 719 Select. Both bats come with a bit of a load in the drop 8 as well as a two piece hybrid design. We think the 718 Select felt a little better on mishits than the Techzilla—but it was not by much. Anderson’s 2019 USA Techzilla is a two piece hybrid bat. Meaning, the handle is made of composite while the barrel is made of aluminum. The connective ability of the bat helps dampen sting on mishits and improves the general feel of hits. The Techzilla USA is a drop 8 bat. Meaning, the bat’s length and weight have a numerical difference of 8. So, the 30-inch will weight, roughly, 22 ounces. The bat does have a bit of an end load but not by much, really.